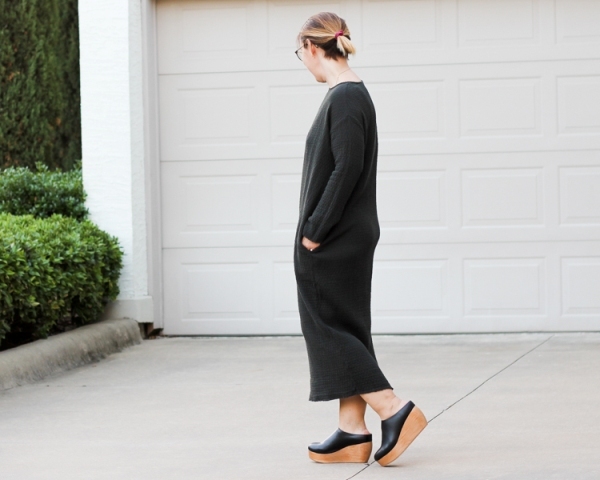 In my opinion, this type of shoes such clogs is very comfy and easy-to-combine, so no matter where you want to go, you should add them to your outfit. 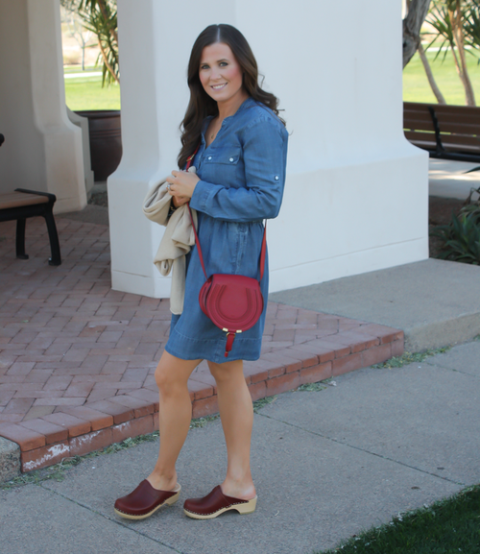 Every fashionista or fashion blogger has at least one pair of clogs, so I’m sure you will like them too. 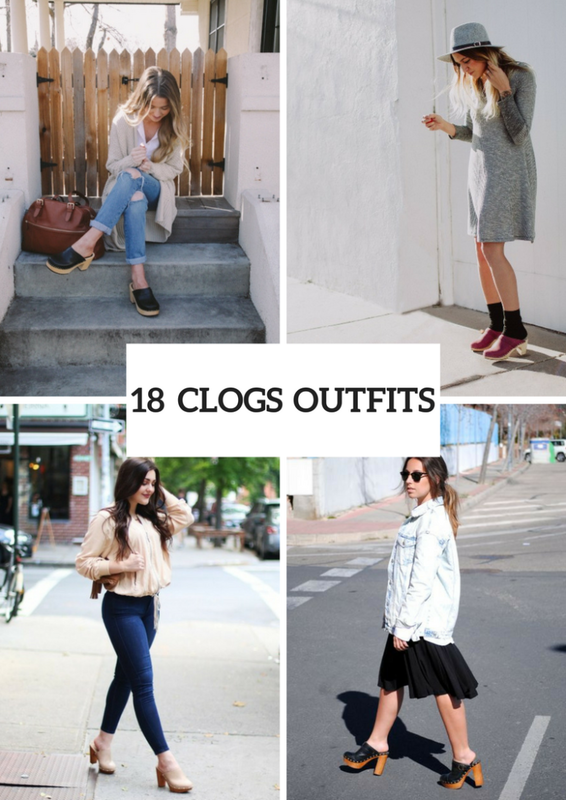 But first of all, let’s find out what clogs are. They are a type of shoes made in part from wood (initially, they were completely from wood, but nowadays clogs have only a wood sole). You can combine them with distressed jeans, classic trousers, trendy culottes, feminine skirts and oversized dresses. So now let’s scroll down and consider all ideas. 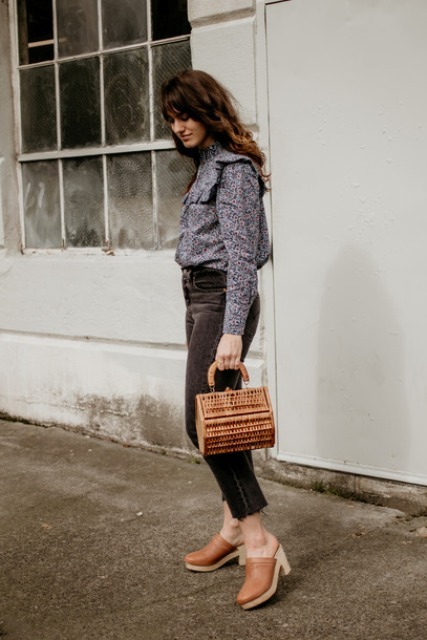 If you love a minimalistic style, then you can combine brown heeled clogs with a classic white button down shirt, gray crop skinny pants and a blue leather chain strap bag. Or you can take a beige (or any pastel colored) blouse and mix it with a small bag, skinny jeans and beige clogs. To make a more fashionable look you can try to repeat a combination with a white shirt, a white maxi cardigan, printed culottes and fringe clogs. Or choose a gray ruffled blouse and pair it with gray velvet crop trousers, light brown clogs and a straw basket bag. 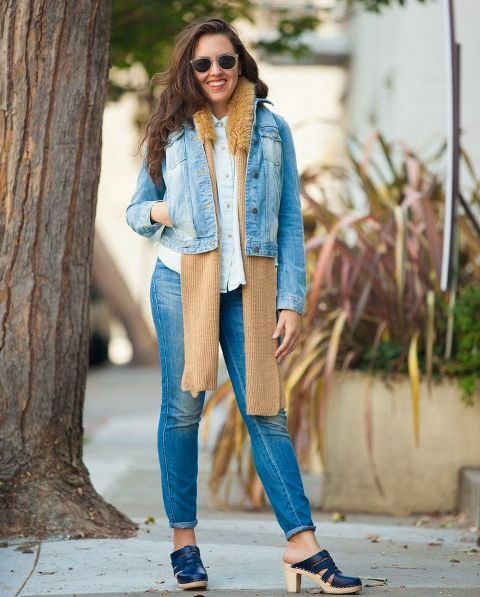 For cold fall days you should combine a denim shirt with a black leather jacket, a red oversized scarf, black leggings and black platform clogs. For creating a casual outfit you can take a black knee-length dress and combine it with an oversized denim jacket, sunglasses and black heeled shoes. Or mix a gray knee-length dress with a gray wide brim hat, black socks and marsala clogs. For more flirty looks you can pair a white t-shirt with a light blue mini dress, a brown leather bag and heels.